Date- 21/04/2015. Tuesday. Cape Argus News Paper. Cape Town. South Africa. When Somen Debnath talks about his life, he breaks it down in numbers. 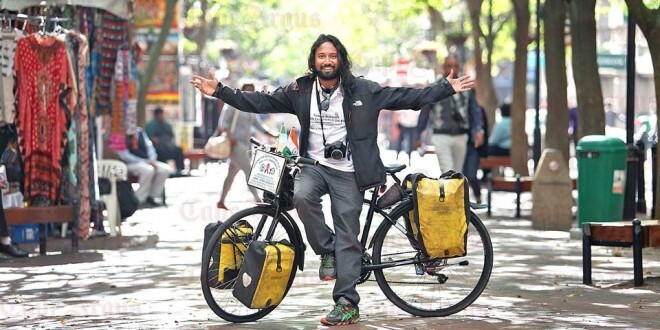 It’s been 10 years, eight months, and 21 days since he left his native village of Basanti, in India’s West Bengal state, and set off to visit 191 countries, traversing 200 000km – all on one bicycle. In 2004, two days after receiving a bachelor’s degree in zoology from the University of Calcutta, Debnath loaded a bike with a bed mat, sleeping bag and tent, and pedalled off to educate young people about the HIV/Aids pandemic, and to share Indian culture with the world. More than a decade and 117 600km later, 31-year-old Debnath still sleeps on the same mat, but his pack has acquired new treasures – five passports, 97 visas and 4 000 banded and beaded bracelets, symbols of someone journeying with him in spirit. 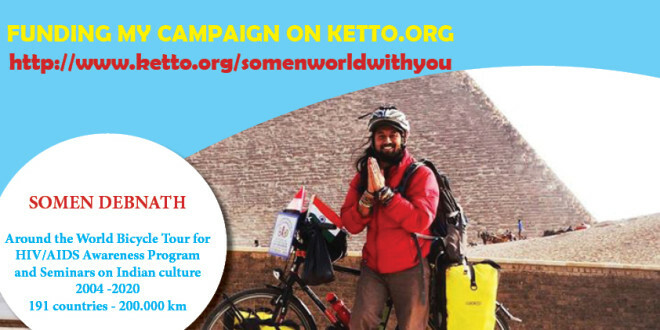 Debnath’s “Around the World Bicycle Tour for HIV/Aids Awareness Programme and Presentation of Indian Culture” brought him to South Africa little more than two months ago. He’s been in Cape Town for about two weeks, staying at the Shri Siva Aalayam Hindu Temple in Rylands, meeting with mayor Patricia de Lille and MEC for Economic Opportunities Alan Winde, and presenting on HIV/Aids at local institutions. He’s on to Namibia, Botswana and Angola next, and then South America, riding Chile’s coast down through Patagonia and ferrying across the Southern Sea to Antarctica. He hopes to complete the record-breaking trip in India on May 27, 2020 – exactly 16 years after he left. “If I’m alive,” he said. You will make it home in 16 years,remeber your prayers and our prayers they blessing..god his with you always…with love and good work be safe..will be looking after you,your not alone…….go well…regards Mohau. Hey friend!just checking how is you and how far with you’re trip? ?